In the early 1950s, rumors began circulating that a crashed UFO had been recovered on the Norwegian-owned island of Spitzbergen., or Spitsbergen, is one of a group of islands called Svalbard, which have been Norwegian possessions since the 1920s. The islands lie over 500 miles north of Norway, inside the Arctic Circle. The few thousand inhabitants of the island were once mostly coal miners, but in recent years an increase in tourism due to the natural beauty of the islands has opened up other areas of income for them. There are actually two separate UFO crash stories about Spitzbergen. The first is that a crashed UFO and alien bodies were discovered there in May, 1946. The story goes that in August of 1946 retired (General James H. Doolittle) made a visit to Spitzbergen to see the craft while on a trip to Sweden for his employer, the Shell Oil Company. Some sources say he arranged for it to be brought to the U.S. for study. The 1952 Spitzbergen crash story first appeared in the German newspaper “Saarbrücker Zeitung” in June 1952. The article, entitled "Auf Spitzbergen landete Fliegende Untertasse", was soon picked up by several other German newspapers, with many of them citing “The Stuttgarter Tagerblatt” as the original source. The story was that jets of the Norwegian Air Force spotted a crashed UFO while flying over Spitzbergen on maneuvers. The craft was disc-shaped with a series of jets around the rim of the disc to make it spin. According to the first article about the crash, the craft was an unmanned, remote-controlled vehicle with Russian writing on the controls, but as the story was embroidered with each retelling, it soon acquired seven alien crewmen who were burned to death in the crash. This version is said to have been reported briefly by journalist Dorothy Kilgallen, and to have been immediately pulled from the news media by the U.S. military. It has been said that "according to former sailors who were serving on the battleship U.S.S. 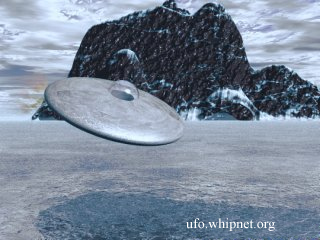 Alabama at the time, the UFO was brought to the U.S. on that vessel directly from Spitzbergen." The 1946 case, more than anything else, is memorable for its characters. The legend goes something like this; In 1946, General James H. Doolittle was sent to Sweden by the Shell Oil Company, supposedly to investigate the mystery of the "Ghost Rockets." Why an oil company would investigate UFOs is beyond common understanding, unless they felt this could strengthen their profits somehow. The 1946 story is a mixture of stories as told by various sources. General Doolittle went to Sweden for the Shell Oil Company in 1946, and he was apparently asked to investigate the phenomenon of "Ghost Rockets" while on this trip. Whether he went to Spitzbergen during this trip is unverifiable. 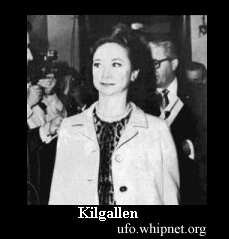 Several sources say that Dorothy Kilgallen claimed to have been told by someone high in the British government (Possibly Lord Mountbatten.) that a crashed UFO had been recovered and was being studied by the British and U.S. governments. However, many of the sources make no mention of Spitzbergen, insinuating instead that Britain itself was the crash site. Kilgallen, although she is perhaps best known today for being a panelist on the TV game show "What's My Line?" in the 1950s and 1960s, was a well-known journalist who not only wrote a "gossip column", but also covered hard news stories. She covered the Lindbergh kidnapping and in the 1950s covered the Sam Sheppard murder trial. She died of a drugs & alcohol overdose under what some said were (mysterious circumstances) after interviewing Jack Ruby about the Kennedy assassination in 1965. Her item about a UFO crash is said to have appeared in “The Los Angeles Examiner”. In addition to being a game show regular, Kilgallen also was a journalist of a sort, having written "gossip columns," but she also was well known for covering hard current events. She had covered the headline grabbing Lindbergh kidnapping story. In the 1950s, she had covered one of the top stories of her time, the Sam Sheppard murder trial. Her last real claim to fame was in the 1960s when she got an interview with Lee Harvey Oswald killer Jack Ruby. This interview was carried by the "Los Angeles Examiner." She told friends that she had information that would "break the case wide open." On 8th November, 1965, Dorothy Kilgallen, was found dead in her New York apartment. She was fully dressed and sitting upright in her bed. The police reported that she had died from taking a cocktail of alcohol and barbiturates. The notes of her interview with Ruby and the article she was writing on the case had disappeared. Luckily, she had given a friend a draft of her interview. Kilgallen was probably fearful for her own life, since several other writers who had worked on the Oswald / Ruby case had died under "unusual circumstances." Kilgallen's reputation and notoriety was the only thing that kept the weak story of the Spitzbergen crash of 1946 alive. The last hope of further research into the Norwegian crash died along with her, as her sources were never verified. Somehow, he supposedly wound up in Spitzbergen. There are a number of Internet sites which claim that there was a short lived article published in America of a UFO crash in the Norwegian city about this time. Some people claim to have seen the article. The really odd thing about the tale of this case is the question must be asked what does Doolittle have to do with UFOs or this story, since he is only mentioned as being in the area and that is the end of his involvement. The only redeeming part of this particular case is that it was reported by Dorothy Kilgallen, celebrity for her years appearing on the "What's My Line?" TV game show. She claimed that someone in the upper echelon of the British government informed her that a UFO had crashed near Spitzbergen, and was under investigation by the British and American military. Supposedly, this informant was Lord Mountbatten. Some investigators claim that since no mention of the name Spitzbergen was found in the reports that the location's mention was to cover up a crash in Great Britain. A crash in Great Britain during the same time period has no basis in fact either. Did a UFO Crash on Spitzbergen in 1952? The other Spitzbergen crash story first appeared in the German newspaper “Saarbrücker Zeitung” in June 1952. The article, entitled "Auf Spitzbergen landete Fliegende Untertasse", was soon picked up by several other German newspapers, with many of them citing “The Stuttgarter Tagerblatt” as the original source. The story was that jets of the Norwegian Air Force spotted a crashed UFO while flying over Spitzbergen on maneuvers. The craft was disc-shaped with a series of jets around the rim of the disc to make it spin. According to the first article about the crash, the craft was an unmanned, remote-controlled vehicle with Russian writing on the controls, but as the story was embroidered with each retelling, it soon acquired seven alien crewmen who were burned to death in the crash. Some of you are certainly familiar with the basic facts of the story, but for all of us to get well acquainted with it, we'll start off with the original source. We believe the first mention of a saucer crash on Spitsbergen is probably an article in a German newspaper, Saarbrücker Zeitung (1), 28 June 1952, entitled "Auf Spitzbergen landete Fliegende Untertasse". Following, is and English translation of that article. The puzzle finally solved? - "Silvery disc with dome of plexiglass and 46 jets on the rim" - Soviet origin? Norwegian jet planes had just started this year's summer maneuvers over Spitsbergen. A squadron of six planes were approaching, at maximum speed, the Nordaustlandet, where units of the supposed opponent had been reported. The jets had just crossed over the Hinlopen Straits when crackling and rustling noises could be heard on all ear phones and radio receivers. Radio contact among the jets was no longer possible; all means of communication between the jets seemed to be out of order. The radar reading, which had been showing "white" since from Narvik, was now on "red". This indicated an alert, the approach of a metallic alien object equipped with a radio direction finder that had a different frequency from that of the fighters. Nevertheless, the highly experienced pilots were able to communicate with each other by means of circling and diving, so that each of them was aware of circling and diving, so that each of them was aware of their common situation, each one searching the horizon with the utmost attention. The six fighters circled for some time not finding anything that was out of the ordinary. By chance, Air Captain Olaf Larsen happened to look down. Immediately he started to dive, followed by his squadron. On the white snowy landscape, the crusty surface of which had an icy glitter, there was a metallic, glittering circular disc of between 40 and 50 meters diameter, which was even brighter than icy snow. Between some wires and a tangle of supporting struts in the middle, the remains of an apparently partly destroyed cockpit protruded. While circling for 60 minutes, the jet pilots could neither detect any sign of life nor determine the origin or type of the vehicle. Finally, they took course for Narvik in order to report their strange findings. Just a few hours later, five big flying boats, equipped with landing skis, took off for the place of discovery. They landed safely next to the bluish steel disc, which was sitting in a bed of snow and ice of more than one meter's depth. "Undoubtedly one of the infamous flying saucers", claimed Dr. Norsel, a Norwegian rocket specialist, who had insisted on joining the flight. He also established the reason why all means of communication of the fighter planes had broken down on entering the zone of the landing spot, and why the radar equipment had signaled the alarm: a radio direction finder equipped with a plutonium core was undamaged and transmitting on all wave lengths at a frequency of 934 Hertz, which is not known by any country. A precise inspection of the remote-controlled flying disc that landed on the Nordaustlandet of Spitsbergen due to interference problems, led to the following indisputable information. 1. The flying object, which has a diameter of 48,88 meters and slanting sides, is round and was unmanned. 2. The circular steel object, is made out of an unknown metal compound, resembles a silver disc. After ignition, 46 automatic jets, located at equal distances on the outer ring, rotate the disc around a plexiglassed center ball, that contains measuring and control devices for remote control. 3. The measuring instruments (gauges) have Russian symbols. 4. The action radius of the disc seems to be more than 30.000 km, and the altitude over 160 km. 5. 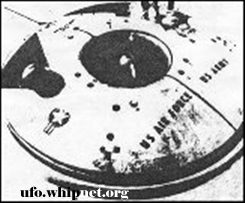 The flying object, which resembles one of the legendary "flying saucers", has sufficient room for high explosive bombs, possibly nuclear bombs. The Norwegian specialists assumed that the disc had started from the Soviet Union and had gone down over Spitsbergen due to a mistake in transmitting or receiving, being incapacitated because of the hard landing. The strange, remote-controlled, unmanned jet plane will be brought to Narvik on board a ship for further investigation. After hearing of the description of the disc, the German V-weapon designer Riedel stated: "That's a typical V-7 on whose serial production I have worked myself". What do we make of these stories? (Ole Jonny Brænne, of UFO Norway), says that his investigation shows that the second story must be a hoax. He says that the Norwegian Air Force had no jets in 1952 that could have been flying over Spitzbergen. He also went though the 1952 files of the island's own newspaper, “Svalbardposten” and was unable to find even the slightest mention of the story, likewise for Norwegian newspapers of that year. He was also unable verify that there was ever a newspaper called “The Stuttgarter Tagerblatt”. The later German newspaper stories seem to have confused the Spitzbergen story with another purported UFO crash that was supposed to have occured on the North Sea Island of Helgoland (Heligoland), a German possession. As for the tantalizing 1946 story, its origins seem to be a mystery. Who can say that there isn't a grain of truth in it? Copyright © 2004 - 2006 .